This morning the Mesa County Commissioners proclaimed May 7-13, 2017, as Correctional Officers Week in Mesa County. 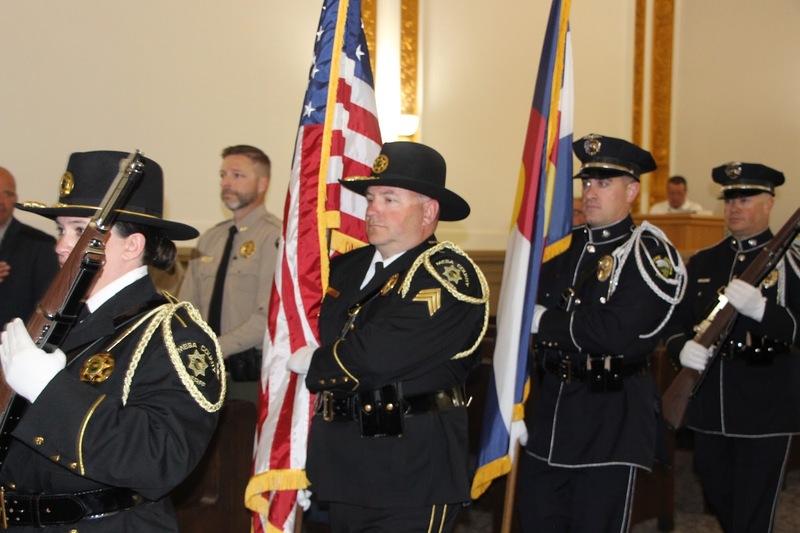 The Color Guard of the Mesa County Sheriff's Office presented the colors before the hearing began. Correctional Officers Week, May 7-13, 2017. Color Guard of the Mesa County Sheriff's Office presents the colors. From left, Commissioner Scott McInnis, Commissioner John Justman, Sheriff Matt Lewis, Captain Art Smith, and Commissioner Rose Pugliese. The Commissioners this morning proclaimed May 7-13, 2017, National Correctional Officers Week. Correctional Officers Week honors the brave men and women who work in the Mesa County Sheriff's Office Detention Facility and correctional officers who work in the jail and are responsible for the safety, containment, and control of more than 480 inmates a day in Mesa County. Mesa County Sheriff Matt Lewis accepts the Correctional Officers Week proclamation and gives thanks to his staff for all their hard work.